Choices in transportation are growing in Berks County. and back home again at the end of your day! JOIN US AS HUNDREDS OF CYCLISTS SHOW BICYCLING IS IMPORTANT TO PENNSYLVANIANS BY BIKING TO THE CAPITOL. Your help is needed to make a difference for bicycling in Pennsylvania . We need a show of force in Harrisburg May 5th, 2009 to demonstrate bicyclists' interest and concern from all sections of the state. When we unite to ride and speak together, we will make a difference. Assemble for Short Bike Ride to the Capitol. Join PA Legislators and Executive Officers as they support Bike Month and bicycling in Pennsylvania. Educate our legislators about bicyclists' issues. Gain more support for pro-cyclist legislation, HB 1110 and SB776. (38 House sponsors, there are 203 Representatives; 15 Senate sponsors, there are 50 Senators). You can review the legislation on the General Assembly's website. Meet with your Representative and Senator to explain the importance of legislation to require motorists to provide a safe passing distance and share why bicycling is important to you. Use the Meeting Feedback Form that is provided. Please dress in business attire if you are meeting with the General Assembly. If you are using your bike as transportation to the Capitol something a bit less formal may be necessary, but please don't wear cleats or form-fitting bike clothing (or shorts). We've been told by many in the know that a professional appearance is imperative when meeting with elected officials and their staff. Attend the Bicyclists' Forum presented by Bicycle Access Council that will be held in the nearby Keystone Building , PUC Hearing Room #3 located on the Plaza Level at 1:15 PM. Contact your Representative and Senator and tell them that it is important to you that they attend the Rally in support of bicycling in Pennsylvania on May 5th. Email, Phone, or Fax. This will take just a few minutes. Meet with your Representative and Senator in their district offices and ask them to support HB1110 or SB776 and explain why this legislation is necessary and why bicycling is important to you. Complete the Meeting Feedback form and mail to: PO Box 6795 , Wyomissing , PA 19610 . Thank them for their support of issues important to you if they are already co-sponsors. Rain or Shine, we can show how much we care about the importance of bicycling in Pennsylvania by Rallying on May 5. Register today so we can better prepare. KEEP KIDS ALIVE DRIVE 25 DAY - A CALL TO ACTION! The focus of KKAD25 Day is on the messages we send through our driving behaviors; in a word, through our “manners” behind the wheel. Most often when we consider manners, words like “please”, “thank you,” and “excuse me” come to mind. Or, we imagine actions like opening doors for others as a courtesy. Manners really have everything to do with the quality of relationships we have with each other as human beings. We know this so well in how these courtesies make a difference at home, with neighbors, at school, at work, or just out and about in this world. In short, manners reflect the best of how we would like to present ourselves to others. This KEEP KIDS ALIVE DRIVE 25® Day (and every day), let’s each make a commitment to be mindful of our manners – to be the best we can be - behind the wheel. Buckle up everyone, every trip every time. Obey the posted speed limit on every roadway. The life you save may be your own, or someone you love. Adjust your speed downward according to presence of children at play in their yards, pedestrians on the sidewalk (or even in street if you are in a neighborhood without sidewalks), or due to weather conditions. Make driving the speed limit, or slower if necessary, a common courtesy to share with neighbors every day of the year. Stop! Take 3 To See® at every stop sign. It’s great practice for when we really do need to stop – and we never know when that moment may be. Realize that It’s Not A Race! Create Space© – Practice safe space management. At the very least, make sure there are three seconds between you and the car ahead gives you time and distance to respond to problems in the lane ahead of you. See Driving Skills for Life. Don’t drive while “intexticated” and don’t be “cellfish.” If you must, pull off into a safe place (a parking lot or rest stop) to text or use your cell phone. We can invite others to join in by sending the KEEP KIDS ALIVE DRIVE 25® message via a yard sign, vehicle magnet, bumper sticker, or trash can decal. Visit the KKAD25 Store. 40% of all purchases count as a tax-deductible donation to support the mission of KEEP KIDS ALIVE DRIVE 25®. Make this KEEP KIDS ALIVE DRIVE 25® Day the beginning of safe travel into graduations and on into summer, and the rest of your life. Remember, the target is, “Zero Deaths, Zero Injuries.” These are the only acceptable goals. Let’s each do our part by practicing our manners on the road. Thanks! http://www.keepkidsalivedrive25.org/ – Keep up with the latest at the KKAD25 Blog. CHAPEL HILL, NC —Registration is open for 2009 Walk to School Day, aninternational event where communities from more than 40 countries jointogether to walk and bicycle to school. Walk to School Day is October7, 2009. To register a Walk to School event, please visit www.walktoschool.org/register. Registration is free and available to individuals or organizations holding an event in the U.S. Registered schools will be displayed on an interactive map on the U.S. Walk toSchool Web site (www.walktoschool.org), where neighboring communities, media and other organizations will be able to view participating schools. By registering, Walk to School organizers gain access to a variety ofdownloadable materials, including certificates, templates for printingstickers and a frequent walker punch card. Registrants can alsosubscribe to a weekly Walk to School e-newsletter with tips and resources on holding a Walk to School event. Since 1997, communities around the country have been celebrating Walkto School Day. In its twelfth year, participation reached a record high with more than 2,800 events from all fifty states and the District of Columbia registering on the Walk to School Web site(www.walktoschool.org) in 2008. Many more communities held events but did not register. Around the globe, International Walk to School Month brought together more than 40 countries in recognition of the common interest in walking to school. Walk to School events are a way for schools and communities to build enthusiasm for walking to school, promote the benefits of walking and bicycling and bring visibility to any safety concerns. More than one-half (55 percent) of events are part of ongoing efforts to promotewalking and bicycling throughout the year. According to a survey by the National Center for Safe Routes to School (www.saferoutesinfo.org), the top three reasons communities participate in Walk to School Day are: physical activity/obesity prevention, support for a Safe Routes toSchool program, and pedestrian safety. For more information on Walk to School activities in the U.S., pleasevisit www.walktoschool.org. To see photos from past events, pleasevisit www.iwalktoschool.org/photos/. Both the U.S. and the International Walk to School Web sites are hosted by the National Center for Safe Routes to School. For more information, contact Raquel Rivas at (919) 962-5835. 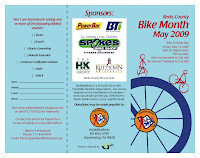 May 2009 is Bike Month in Berks County! May is also National Bike Month. The League of American Bicyclists has put together a list of 50 ways to celebrate bike month. Cinco de Mayo? Join the PA Bike Summit! Let us know how you plan to celebrate cycling! Of all the Fastlane entries over the first days of this Administration, the one that has generated the most responses is the one on my address to the National Bike Summit. We all know that bikers are passionate about their wheels; we also know that bicyclists are vulnerable to automobiles and need secure lanes and greater awareness from drivers. On Earth Day, it seems appropriate to talk about bicycling, not only as recreation, but as an environmentally sound commuting option. And, about what the DOT is doing to improve the cyclist's commute. Bicycling was one of the earliest beneficiaries of stimulus funding, with portions of the American Reinvestment and Recovery Act explicitly devoted to bicycling, and this department has been very active in getting that funding out the door. Ever since Rails-to-Trails Conservancy first launched TrailLink.com on August 16, 2000, we’ve been striving to make it the best FREE trail-finder Web site for our members and trail enthusiasts. That’s why we’re proud to unveil the newest version of TrailLink.com to you, today. This is just round one of TrailLink.com’s 2009 upgrades. Keep checking back to find new trails and trail maps, more photos, more reviews and cooler features to help you make the most of every trip on a trail. to those who consider joining us. Please see the below letter that will be going out to area businesses and share with your friends and employers. 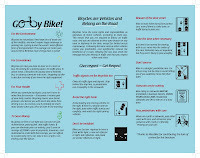 Also, please check out our new Bike To Work brochures! Please consider partnering with WalkBikeBerks for the county’s most healthy and inspiring event. WalkBikeBerks in conjunction with the Berks County Commissioners, Reading Mayor, and BARTA are gearing up for this year’s Bike to Work Day celebration on May 15, 2009. To help promote the month and day WalkBikeBerks will be awarding prizes thanks to the generous sponsorship of Spokes Bicycle Shop and contributing sponsors Power Bar, Kutztown University, Berks Technical Institute , H&K Printing and the Berks County Bicycle Club! WalkBikeBerks believes regional planning that includes bicycle and pedestrian transportation spurs community interaction while protecting the open spaces and unique characteristics of this area for future generations. Celebrating Bike to Work affirms our message: Berks County residents can enhance air quality, reduce traffic congestion, and improve personal health and fitness by commuting to work by bicycle. Together, we can build livable communities across our great county. Berks County Commissioners have officially proclaimed May 2009 Bike Month, May 11-15 Bike Week, and May 15, 2009 Bike to Work Day. Bike Month is a national event led by the League of American Bicyclists in which hundreds of thousands of cyclists promote fun, healthy, environmentally sustainable transportation alternatives for commuters. Biking to work builds morale, encourages camaraderie, and is a great way to get active in your community. Active employees are more alert, take fewer sick days, and are more productive. Most importantly, perhaps, biking reduces your carbon footprint, reduces traffic congestion, and can save you money. Grand Prize - A gift certificate for $200 at Spokes Bike Shop good for purchase toward any in-stock bicycle. 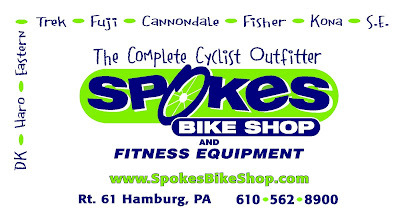 Third Prize - A gift certificate for $50 at Spokes Bike Shop good for purchase of any in-stock merchandise. The Grand Prize will be raffled off to the employee of any Berks County business that has the most number of employees who bicycle to or from work during Bike To Work month of May. The Second Prize will be awarded to any Berks County resident who has the most number of trips to or from work by bicycle during the month of May. A trip can either be from an employee’s home to work or from work to home. The Third Prize will be awarded to any Berks County resident who has the most commuting miles to and from work by bicycle throughout the month of May. All prizes winners will be announced and notified shortly after the end of May as results are tallied. You can help us promote Bike To Work month in a number of ways. 1 - Announce that May is Bike To Work month to your employees and encourage them to participate in this healthy activity. 2 - Announce the prizes that WalkBikeBerks will be awarding to your employees and help track their progress. 3 - Start your own contest and award prizes to your employees! 4 - Announce to your employees to meet us at the Brentwood Trailhead on Friday May 15th at 6:45a.m. to bicycle to City Hall! Our local leaders and representatives will be present and giveaways from Power Bar will be available! 5 - Become a WalkBikeBerks corporate sponsor. All contributions are tax deductible as we are a 501(c)(3) non-profit charity. Let us know you will participate! For more information about how you can help promote Bike To Work Month and track your employees' progress and submit results, please email us at jslonaker@walkbikeberks.org! We hope to see you and your employees on your bikes in May! Your help is needed to make a difference for bicycling in Pennsylvania. We need a show of force in Harrisburg May 5th, 2009 to demonstrate bicyclists’ interest and concern from all sections of the state. When we unite to ride and speak together, we will make a difference. 8:30 AM Assemble at Farm Show Complex, 2300 N Cameron St, Harrisburg, PA.
Join PA Legislators, Executive Officers and the Governor as they support Bike Month and bicycling in Pennsylvania. Educate our legislators about bicyclists’ issues. Gain more support for pro-cyclist legislation, HB 1110 and SB776. (38 House sponsors, there are 203 Representatives; 15 Senate sponsors, there are 50 Senators). Meet with your Representative and Senator to explain the importance of legislation to require motorists to provide a safe passing distance and share why bicycling is important to you. Attend the Bicyclist Forum presented by Bicycle Access Council that will be held in the nearby Keystone Building, PUC Hearing Room #3 located on the Plaza Level at 1:15 PM. For more information, visit www.bicycleaccess-pa.org. Contact your Representative and Senator and tell them that it is important to you that they attend the Rally in support of bicycling in Pennsylvania on May 5th. Email, Phone, or Fax. This will take just a few minutes. Meet with your Representative and Senator in their district offices and ask them to support HB1110 or SB776 and explain why this legislation is necessary and why bicycling is important to you. If they are already co-sponsors, thank them for their support of issues important to you. Register today at http://pawalksbikes.org/ so we can better prepare. If you have questions, need more information, contact 610-779-9702 or pawalkbike@gmail.com. Thank you. Senator Mike Folmer, member of LVBC, has introduced SB776 which is the companion bill to HB1110 to require motorists to leave four feet when passing cyclists and other safety measures. Senator Folmer represents Lebanon, Berks, Lancaster, and Chester Counties. There are 14 co sponsors due to the efforts of Pat and Ed Krebs, WalkBikeBerks, Bicycle Coalition of Greater Philadelphia and Bike Pittsburgh. We need cyclists to continue to convince Senators to support this legislation and become co-sponsors as well. Please ask family, friends, fellow employees who may live in other legislators' districts to help you with your lobbying efforts so that Pennsylvania is a very safe cycling state. Two hour shifts starting at 11:00 for set up. To Volunteer, email info@walkbikeberks.org or call Michele at 610-779-9702. Free Escorted walks to five cherry tree trail destinations. Sign-up at the RiverPlace information table. Space is limited, to reserve your space as soon as possible. Hundreds of cyclists from across PA will demonstrate our need for bicycle legislation and Livable Communities. 10:00 a.m. Representative Dave Kessler and Senator O'Pake will read their House and Senate Resolutions, and there will be reading of Governor Rendell's Bike Month Proclamation. We encourage attendees to make appointments to meet with their legislators to encourage them to support the safe passing legislation introduced by Rep. Ron Miller and the Bicycle Access Council. To register for this event: write to info@walkbikeberks.org or call 610-779-9702. Event: Ride to City Hall with WalkBikeBerks and our county's leaders to celebrate Bike to Work Day. Thank you for joining us to make Berks County a more Livable Community that is better for walking and biking. These businesses are generously supporting Bike Month 2009. To become a sponsor or to learn more, please write to info@walkbikeberks.org. Great news, Senator Specter has just signed on as a co-sponsor for the complete streets bill! Thanks so much for your efforts, as you can see they paid off. Now that he's on the bill we'd really appreciate it if you took a few moments to send a thank you letter. Take time to tell Senater Specter why your local neighborhood needs Complete Streets. Personal stories are important. Please let me know if you can send a letter. Also, please ask others in PA to send a thank you letter as well. Bike to Harrisburg -- May 5, 2009! Imagine: Hundreds of bicycles on the stairs of our state capitol building in Harrisburg to promote Bike Month, support bicycle friendly legislation, and to demonstrate our desire for better biking in Pennsylvania. Please come to Harrisburg on May 5th to attend the Legislative Bike Rally and Press Conference 10AM at the Capitol Stairs to promote Bike Month & influence policymakers. The event will feature resolutions in the House and Senate introduced respectively by Rep. Kessler and Senator O'Pake and a Proclamation signed by the Governor. After the event we will be visiting our State representatives to advocate for safe passing legislation. Amtrak offers quick and reasonably priced service to Harrisburg from 30th Street Station and Paoli. An express train leaves 30th St at 7:25AM and at Paoli at 7:51 arriving in Harrisburg at 9AM. Fare is $23 each way which is less than half the cost of service to NY or DC. The Train station is a ten minute walk from the Capitol. Only folding bikes are allowed on Amtrak. If you bring one make sure you have this document on your person or in your smartphone in case a surly conductor questions you (that's another issue for another day).